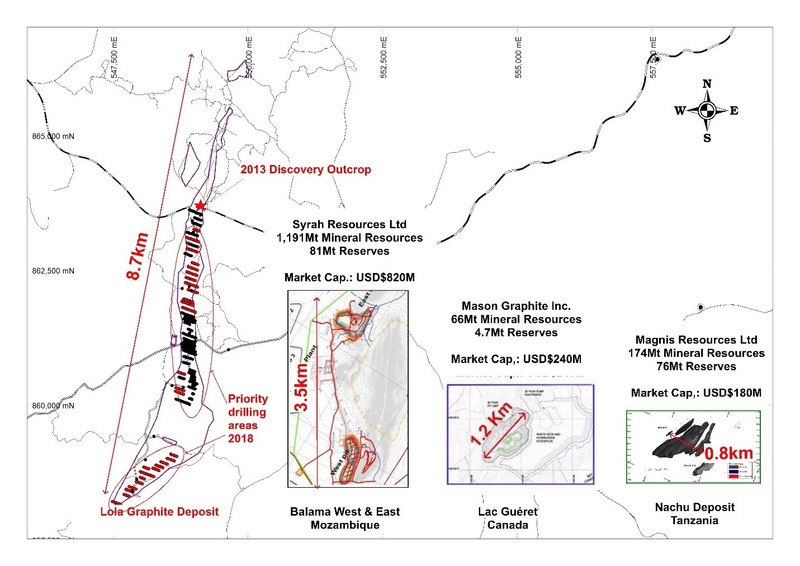 The Lola Graphite Project – SRG Graphite Inc. The Lola Graphite deposit is located approximately 1,000 kilometers South-East of Conakry, the capital of the Republic of Guinea. The deposit was named after the nearby town of Lola, located approximately 3.5 kilometers to the east. The Lola Graphite deposit is present at surface over 8.7 kilometers, an average of 370 meters wide. 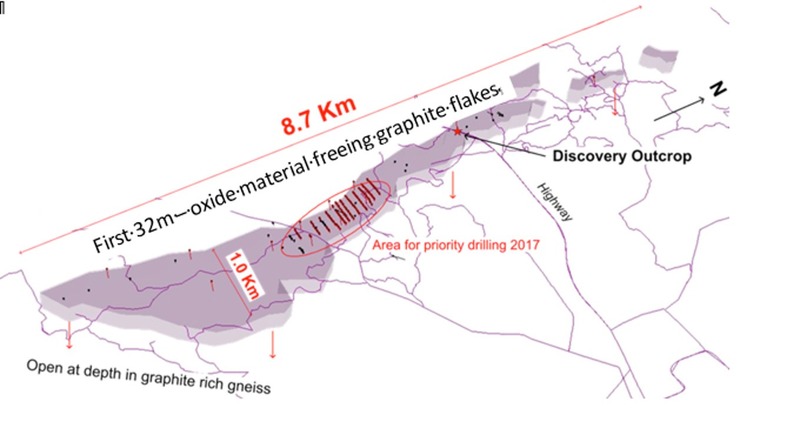 The first 20 to 50 meters (average of 32 meters) of the deposit is well weathered (lateralized), freeing graphite flakes from the silicate gangue and thus allowing for easy grinding and optimal recovery of all large and jumbo flakes. 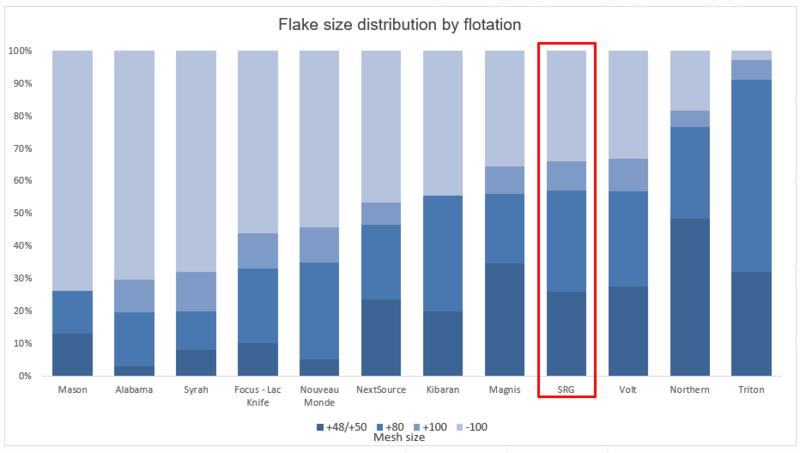 Over 50% of the graphite is large flake (+80mesh), and 26% is “jumbo” flake material (+50 mesh). The Lola Graphite occurrence was originally discovered by BUMIFOM (“Bureau Minier de la France Outremer”) during construction of the Conakry-Lola road in 1951. Shortly after Guinea’s declaration of independence in 1958, the project was abandoned and subsequently forgotten until Sama Resources “re-discovered” the deposit in 2012. The Lola Graphite deposit is one of the largest surface graphite mineralization in the world, with an area of 3. 22 km2 of continuous graphite rich gneiss. The main elemental impurities are Si, Al and Fe, typical for flake graphite. Impurities known to cause issues, such as S. Mn or heavy metals, at very low levels. 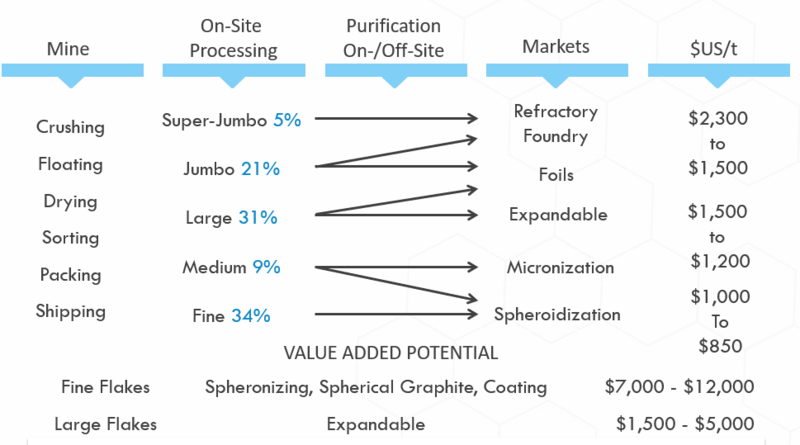 The combination of very favorable ash composition, high crystallinity, high oxidation resistance and excellent purification behaviors makes this graphite very valuable for traditional markets as well as for demanding new tech applications. 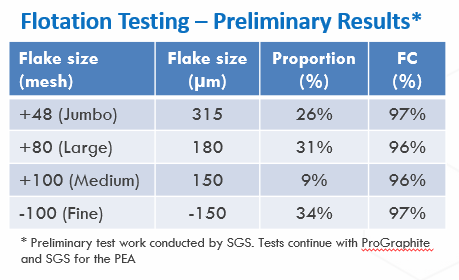 To date, several metallurgical tests have been conducted on the material, with additional metallurgical tests planned for the near future. Typically, between 15-20 tests are carried out in order to fine-tune a flotation flow sheet. A purified spherical graphite product at 99.95 wt.-% TGC was achieved. One of our primary objectives is to establish mineral resources within the weathered portion of the deposit. The weathered material is easily available as it is outcropping at surface, there is no need to remove overburden, nor blasting when mining. We plan to process the material on site using typical flotation with limited use of reagent, and thereby producing no harmful waste.